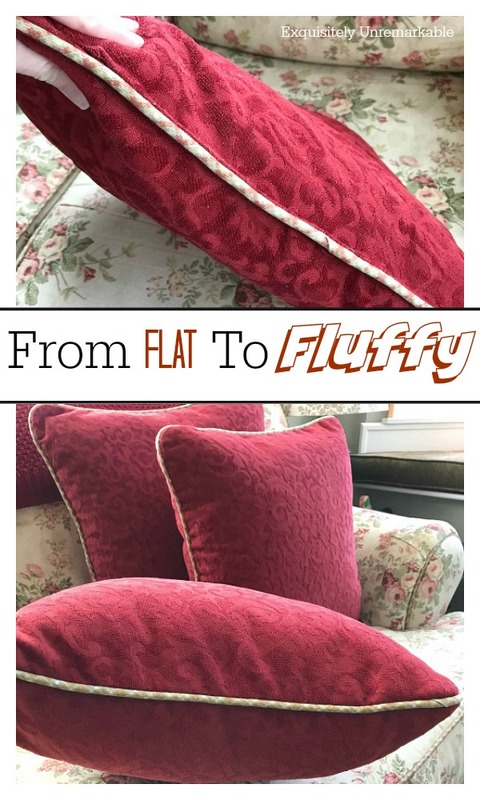 Looking for a quick and easy way to fluff up your old flat pillows? Check out this easy DIY. My family room couch is old. We've had it for almost fifteen years and we use it every day. It's held up pretty well, with the exception of one, um...mishap, but the pillows? Oh the pillows. Well, now that's a totally different story. They had been well loved over the years and it showed. They were saggy and flat, deflated, uncomfortable to rest on, but beyond that ~ and more importantly at least to me ~ they were ugly. They made the whole couch look tired, old and worn. Clearly something had to be done. At first, I considered buying brand new ones, but pillows can be expensive. 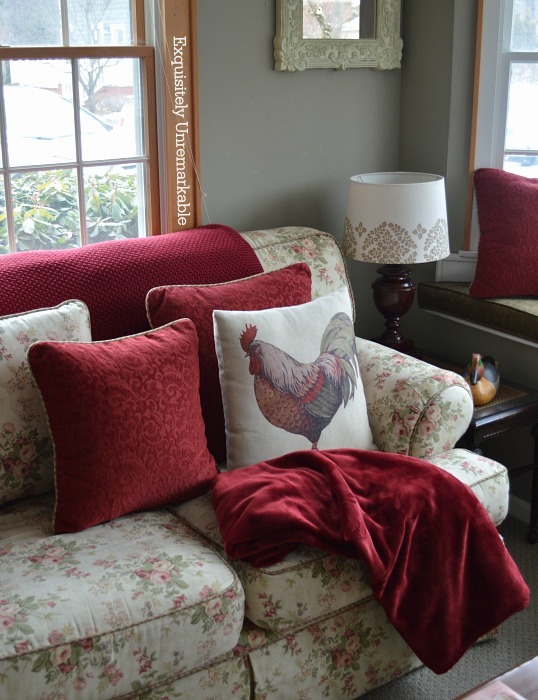 Plus, finding the perfect color and pattern on the shelf to go with a floral couch? Impossible. Next, I thought about making new pillows, but the fabric I chose was nearly identical, so why bother with all that work? The current flat pillows came with couch. It was a custom order, so I picked the fabric and the coordinating trim which was lovely, they matched perfectly. It'd be silly to mess with them. So I decided to swap out the pillow forms with brand new fat and fluffy ones instead. It's a process that would work on any flat pillow you have...your own or perhaps a thrift shop or yard sale find. If the cover is in good shape, it's totally worth it. Of course, my pillows didn't come with a zipper. That would've made this DIY so much easier, but that's ok. It was still a rather simple fix, since the manufacturer's seams were very evident. I find that to be the case on most throw pillows. 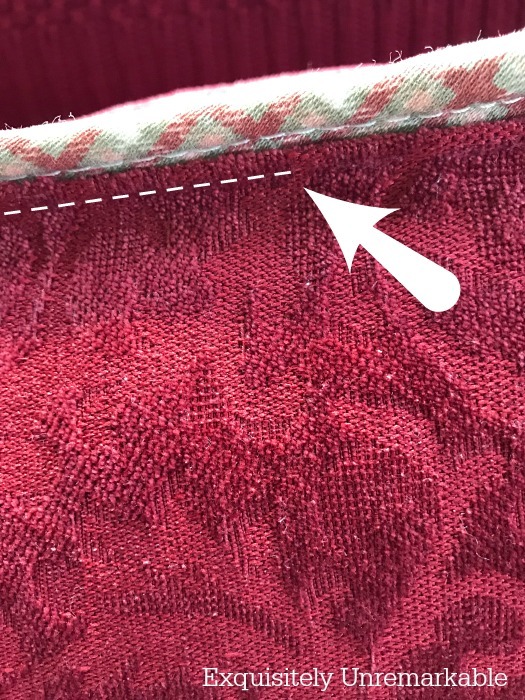 Once I located the seam they used to close the pillow, I used my seam ripper to gently open it up. I removed the old form and decided to wash my covers while I had the chance. I turned them inside out and did not put them in the dryer. I washed one as test to make sure it didn't shrink. If I had been really worried, I could've sent them to the dry cleaner, but I'm cheap and they washed just fine. When they were totally dry, I stuffed them with new forms. 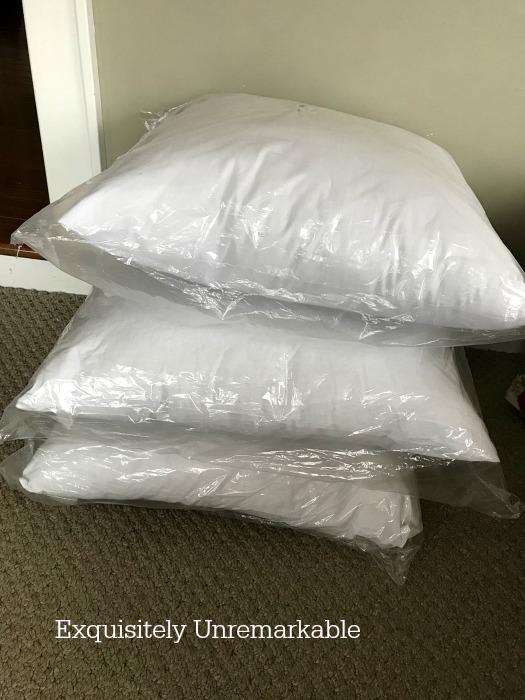 My pillows measured 18" and 20", so I bought 20" and 22" forms. You always want a form that's about 2" larger than your pillow cover. That will give you have a very full pillow...exactly what I was craving. 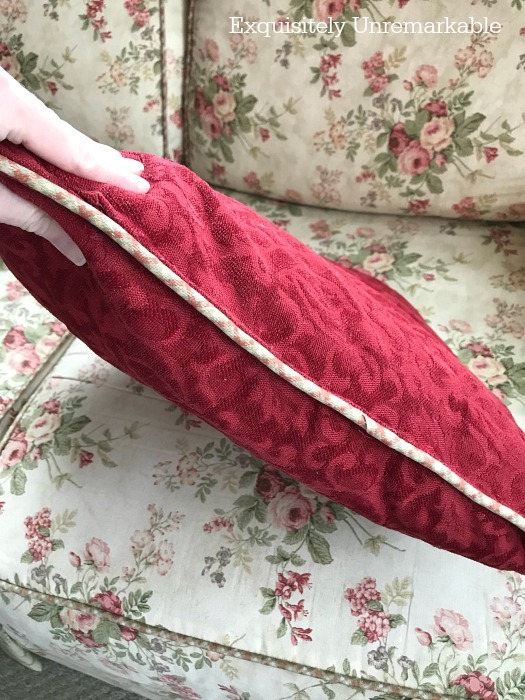 Once my pillow was stuffed, I pushed and pulled the form until it fit perfectly into the corners. Then I stitched those old seams back up. Now, I used a machine. It was a bit of a struggle, which is nothing new with my machine, but this time it wasn't due to technical difficulties. The pillow forms were very large and bulky to maneuver, but once I got the hang of it, it was quick work. 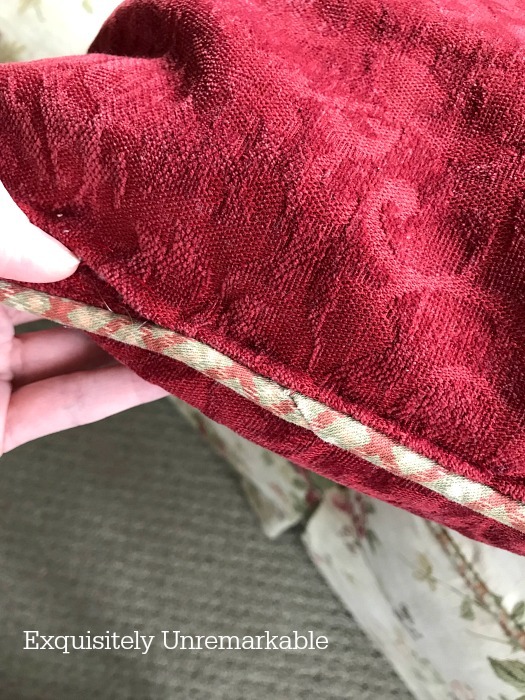 In the past, I have hand stitched the pillows closed. That works, too. It really comes down to whatever you're more comfortable doing. My new seams are actually less conspicuous than the original ones, even if they aren't perfectly straight. But who's looking? When I was done, not only did I have four new fluffy throw pillows, I also had a much nicer looking couch. Fresher. Dare I say almost new. Of course, there is that matter of the patch on the arm. I can still see it from here. Although it is slightly less conspicuous with all those soft and fluffy pillows. Thanks so much! I did not use the zipper foot. I am such a lazy seamstress and a very poorly educated one at that. Everything I know is self taught, trial and error. I should take a lesson! 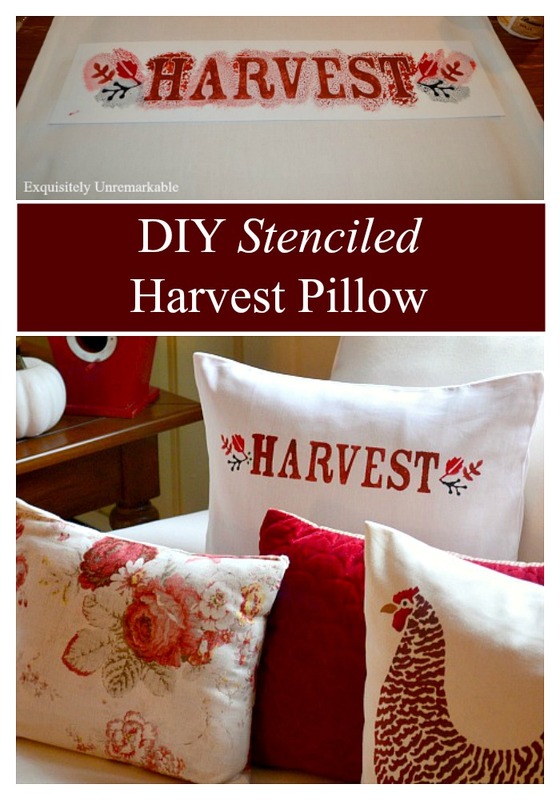 I did make the Harvest pillow but I bought the stencil at JoAnn crafts. I bought the fabric there as well. It's Waverly Norfolk Rose. Hope that helps and thanks for the visit! Good job! And don't worry about the patch. Who cares?!! It's a keeper couch no matter what. Thanks so much, Linda and yes, I do agree about the couch. I love it too much to let it go. Thanks for the visit and the comment! Oh why do they not use zippers! 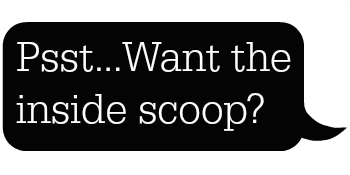 I know that it's more expensive, but I think most people would be willing to pay the extra few bucks for an easier swap. Have fun! And that patch...haha. I can't NOT see it!! They look great. Terrific fix. Thanks Lorri! It was a pretty easy swap! Awesome Kim. 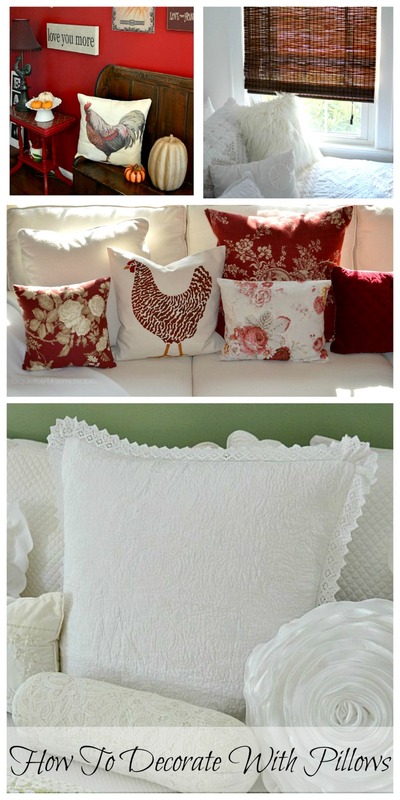 You gave new life to your pillows with an easy fix. Great job. Great job!! Especially sewing the openings back up by machine. I know that had to be a struggle. I had a couple flat couch pillows. Fortunately they have zippers. I managed to find an ugly but correct size throw pillow for a better price than buying a pillow form. I unstuffed one flat pillow, put the throw pillow in that cover. Then I took that stuffing and added it to the other flat couch pillow. Voila! 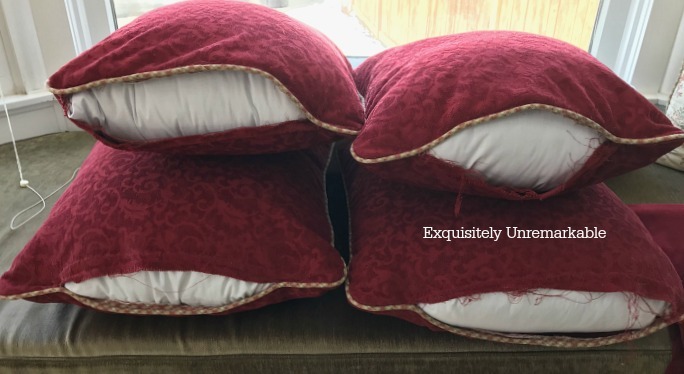 Two not-flat pillows for the price of one! Fabulous Kathy! What a great idea...and you're right. The inserts are not cheap and I went to an industrial reupholstery shop to get them. I wanted really sturdy fat pillows. I'll have to see if it was really worth it...I have my doubts! What a great idea! You totally transformed that couch. How about, on the arm, an arm cover sort of like people used to put doilies (I think). That would cover it maybe. I have been considering that, Brenda, thanks! It’s a great excuse to learn to crochet! What a great idea Kim! Your pillows look fab! Thanks Florence! It wasn't too bad and I love the results! A fluffy pillow makes all the difference! Yours look great, Kim! 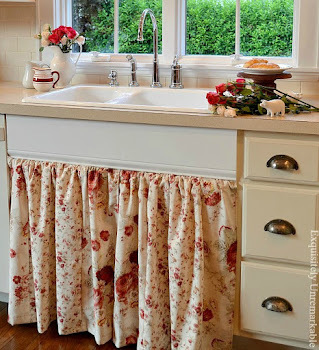 What a great idea - if you can sew! ;-) You are so handy and thrifty. Your "new" pillows look great! Thanks Melanie! While my husband and I were wrestling the pillows through the machine he asked me why we couldn’t just bring them to the dry cleaner to have them stitch up the holes. I probably could’ve. They hem a dress for $10, this couldn’t be much more! You would NOT want to see those pillows had I sewn them, my friend - I'm a disaster with a needle and thread. Great job and I'm sure you were delighted to freshen them up in the washing machine as well! I love that I can swap out my pillow covers and wash them regularly because my pups smash the heck out of them and spend more time on them than I do, that's for sure! You've made a brilliant job on these Kim, and the colour is just terrific. Thanks Jan. I am very happy with them now, fluffy and comfy! Good tip about buying a slightly larger pillow form. They look great and definitely brand new again. Don't you love a good refresher like that? 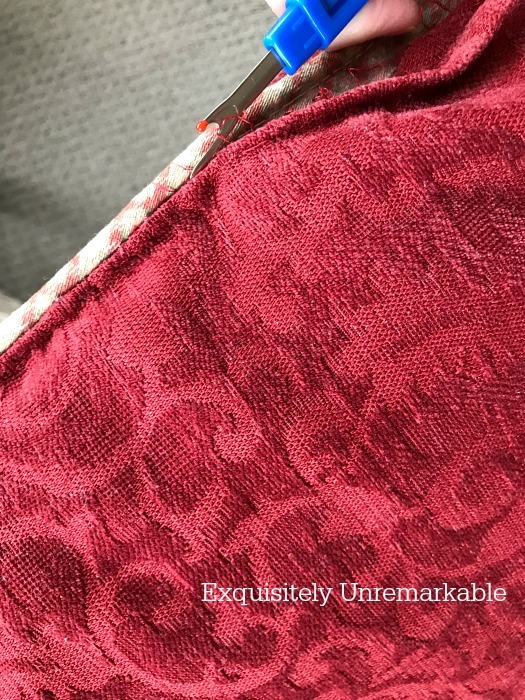 My friend used to make curtains and covers for upholstery and she gave me all her tips. This was a good one! Oh great, Carla! I love when people find a fix. Now that is a brilliant idea, Diana! These babies weren’t cheap…I went to a reupholstery shop to get the professional ones, fat and sturdy so they’d last. We’ll see. I probably would’ve done better at Walmart! Great idea and now they look brand new! Thanks Kristi! When the machine behaves, things are so easy! In pictures, Cheryl! 😉 Although I do like an orderly house, can't relax until it's just so. Think it's genetic! Great, great idea!! I do switch out old pillows with new inserts, but only ones with zippers. So wish I could sew!! I do dislike a flat pillow but a nice new fluffy one is great. Sometimes I find just washing and drying the fluff up nicely for me! Great job on making yours stand out and look so nice. Thanks so much...and yes, I totally agree, Pam! Next time maybe I should try that first!! Why have I never thought about buying a slightly bigger pillow form?! I love that full look! I’ve been making plans to makeover a few pillows, so this is timely help! It makes a real difference, Deanna! They do look fluffy and soft! I usually just grab the pillow and smash it a few times against something and then squeeze it a few times. Doesn't produce the best result but I'm too lazy to do anything else. Its amazing what a new insert will do to the pillows appearance. Way to refresh those throw pillows. Thanks Audra! Smashing and squeezing are my go to fluffing methods. I think that once we passed the decade mark, it was all over! Hopefully I won't have to think about flat pillows for another ten! Ha. Well, how timely!! and great minds do run in the same channels! I went home at lunch and put a new pillow in an old case....and here you are doing the same thing!! I will "redily" admit that mine are nowhere near as pretty as yours...they are black/gray and yellow!, but they look okay in a room that has yellow bedding! Of course, the back-ground is white, because a certain princess Posie sleeps on the pillow most of the day! Such a great idea. They look so fluffy. Thanks Teri! Very fluffy now. And so much better. Thanks so much, Sandra! And Happy Easter to you, too. I love your beautiful pillows, Kim. Well done, my friend. I love your clever, resourceful mind. I'm sure that as soon as I get up and look around all my pillows will suddenly look flat as pancakes. I couldn't take it anymore, Michelle, they were so saggy and sad. They look much better now and honestly, it was a pretty simple DIY. Thanks for the sweet words and the visit! Well done, Kim. They look great. Hope you have a wonderful Easter!! What a difference it made. Love the pillows that have bounce! Happy Easter. Thanks Maria! They certainly do have bounce. Enjoy the holiday weekend! It makes the pillows and the couch look brand new! I have pretty much swapped out all of my regular pillow forms for feather ones from IKEA...very reasonably priced and you can literally slap and pound them into fluffy-submission! Hope you have a lovely Easter, Kim! Unfortunately I don't sew, but I have friends who do and I could probably barter with them! Have a Happy Easter, Kim! That sounds like a plan Ricki! My husband even suggested we run them up to the dry cleaner to have them stitch the holes closed. I thought that was genius. Of course, I didn't do it. I'm a glutton when it comes to that machine! Hi Kim, you did a great job with the pillows. Now they are nice and fat and fluffy. I still did not notice the end of the couch until you mentioned it. No one can notice it unless they are really inspecting the couch. I know we like things perfect but at least you had a great solution for the rip. It's so nice that you are handy and a great sewer.